Mullet Haircut Photos & Tips: Mullet A.K.A. 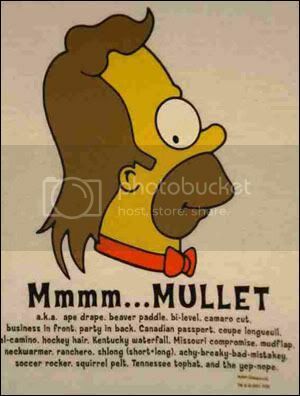 Mmmmmmmmmmmm...Mullet a.k.a. Ape Drape. Beaver Paddle. Bi - Level. Camero Cut. Business in the front, Party in the back. Canadian passport. Coupe Longueuil, El-camino, Hockey hair. Kentucky waterfall. Missouri comprimise. Mudflap. Neckwarmer. Ranchero. Shlonc (short + long). Achy-breaky-bad-mistakey. Soccer rocker. Squirrel pelt. Tennessee tophat. Yep-nope.